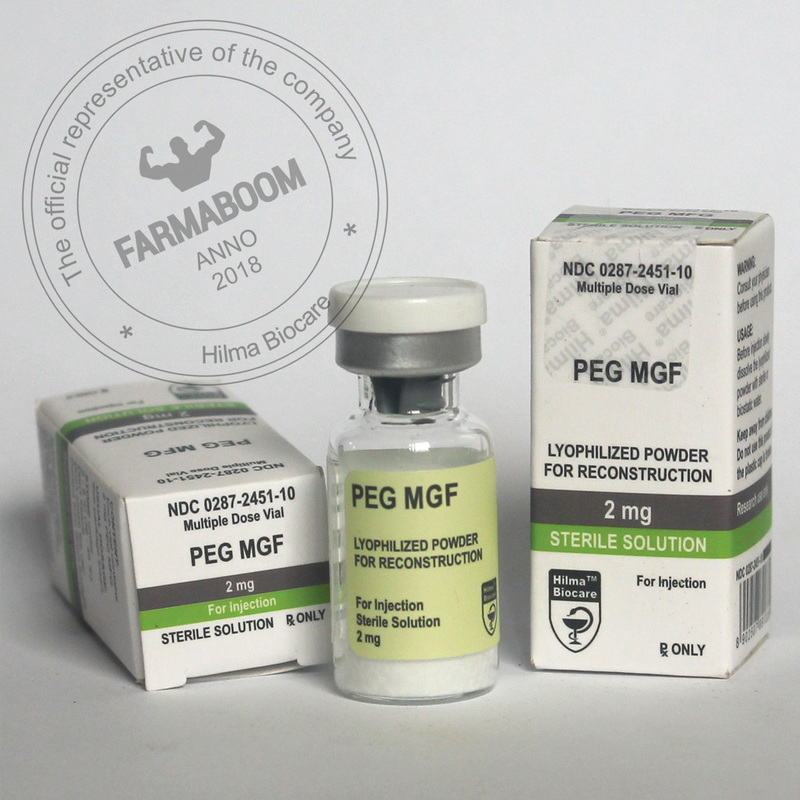 Pegylated Mechano Growth Factor (PEG MGF) is a variant of the IGF-1 (insulin-like growth factor-1), which stimulates myoblasts division and allows for muscle fibers to fuse and mature. This is a process required for growth of adult muscle. The difference between IGF-1 and MGF is that MGF stimulate myoblasts division through stimulation of different receptors. Pegylated MGF is more bioavailable. Injected 2-3 times per week, it maintains effective concentration for a long period. Info: Mechano Growth Factor (MGF) also known as IGF-1Ec is a growth factor/repair factor that is derived from exercised or damaged muscle tissue. It’s called MGF as IGF-IEa is a bit of a mouthful and harder to identify amongst the other IGF variants. In the past, humans had to depend on them body to produce IGF or MGF naturally, but not anymore. Now that scientists have been able to isolate and reproduce these peptide chains, bodybuilders and athletes can recover faster and increase hypertrophy like never before. The connections to MGF activates satellite cells affect on the growth of new muscle fibers in our bodies. Also, the MGF increases the body’s rate of protein synthesis. In that case human bodies start increase muscle size and not just this, it’s also repair damaged muscles. The recovery factor is without question the most important effect of this harmone. Natural MGF is produced locally and does not travel into the bloodstream, synthetic MGF is water based and when administered directly into muscle, travels into the bloodstream. Note: If the product does not dissolve into 1ml of water within a few minutes, do not shake the vial, but instead try adding another 1ml or 2ml of water and leaving the vial to settle for 24 hours in the refrigerator. For the best results, inject MGH directly into the muscle trained and immediately after training. The main MGF effects can be explained in two words hypertrophy and recovery. Testing showed that injections of MGF increased muscle fibers by 25% in three weeks. Wider explanation of benefits by using MGF is increasing vascularity, muscle growth, decrease body fat, faster regeneration, improve immune system, decrease cholesterol level, strengthen bone and skin. The primary negative side effect is hypoglycaemia(low blood sugar and also swelling of extremities, a drop in blood pressure, and various cardiovascular irregularities including cardiac arrest. Pain or irritation at the injected area is the most common complaint, which normally refers to a sore or itchy feeling at the injected site. Vials are freeze-dried and therefore will remain stable at room temperature for 1-2 months. Product can remain in good condition for 6 months if kept in refrigerator (powder). Note: That after dissolution MGF can be stored 20-30 days in the refrigerator. Many will supplement with MGF for four weeks and then IGF-1for four weeks.